Hello Over the Big Moon friends. We are finally in the 70’s and some of the locals are walking around in winter jackets. Too funny! The breeze feels wonderful and cool-crisp mornings are sure to be around the corner. Today I’m sharing with you a sweet and simple Thanksgiving table setting! Are you thinking about Thanksgiving yet? We are spending the holiday in Tokyo but I couldn’t resist setting up a pretty Thanksgiving table setting. Our little Okinawan rental has an open kitchen/living room and the space that might be a dining room is my piano studio. So we eat most of our meals around a little table that sits between the couch and the oven. Literally. We do like to entertain so I bought a 7 ft folding table that stores easily when not in use. With a freshly pressed white tablecloth the folding table turns into a fancy dining area! As with most of our special occasion settings, I looked through my fabric stash to see what I could use. This time I folded and ironed an arrow printed fabric to take place of a table runner. The only plates we brought with us to Japan are our white Ikea plates. I layered in my no-sew cloth napkins (which you can find HERE) to add more pattern. Once the basics were set, I shopped the house for styling items. Mixing metals is something I always do, no matter the rules. I also love mixing real with faux flowers. Can you believe these purple pansies are from the “dollar store”? They are the most real looking faux flowers I’ve ever seen. I did this by adding black and white candles I created for my neutral Fall/ Halloween decor (you can find HERE) and a “I’m thankful for:” card at each place setting. So now we have feathers, arrows, and did you spot the antlers? Not to heavy on Thanksgiving decor but some of my favorite elements for the season. Oh, and it’s about impossible to find a pumpkin in Okinawa right now. To create the “I’m thankful for:” card, download this printable here. Cut into four pieces and paper clip to black card-stock so your guests and family can easily write down their blessings. If you want a more hand printed look, trace the lettering and pinecone with a metallic pen. Thanks for having me, see y’all next month! Love the combination of arrows, feathers, and antlers! Looks awesome!! How beautiful and elegant! I’m going to be hosting Thanksgiving at my new house next year and I’m so excited. Definitely going to save this for next year. I want everything to look really pretty just like this! Love the printable too! Thanks so much! Such exciting news about getting new house! Congrats! The table looks stunning!! Loving the printable! That is so gorgeous! 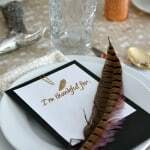 I love the feather and the “I am thankful for” paper. I agree Annette! I’m obsessed with anything and everything feather themed right now!